Not red enough, so this is probably Utah. I expected this to be another heavy space drama. My only basis for that, of course, was the poster, showing Matt Damon in a spacesuit. The last time we saw him in that get-up was in Interstellar, as the stranded scientist-turned-douchebag Dr. Mann, and we all know how heavy that was. Well, the premise was pretty heavy enough. 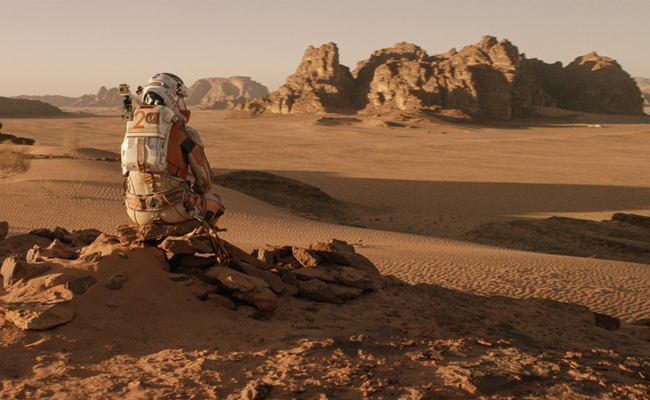 After a Martian sandstorm ruins NASA's exploration team, the entire mission is told to evacuate. One man, of course, gets left behind. Everyone thought he died. But he didn't. Tough luck for Matt Damon, because he's actually still alive. 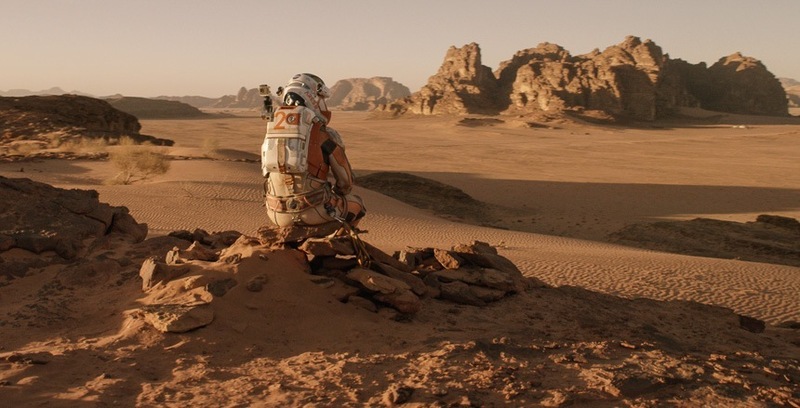 So the "Martian" in the title is actually an Earthling that just happens to be stranded on Mars. This isn't exactly a survival movie like Castaway; neither is it a film about the loneliness and isolation of man in the blackness of space. This is actually a feel-good movie, with humour as its main ingredient. And to make sure that the comedy takes center stage, the filmmakers made sure to cast popular comic faces like Kristen Wiig, Donald Glover, and Michael Peña. That, in my opinion, is what makes this movie work. You have to counter-balance the heavy premise of being left alone to die on the Red Planet with the comedy of... being left alone to die on the Red Planet. Am I making sense? Probably not. But that's how Sir Ridley Scott was able to pull this off, making sure that despite having Jessica Chastain and Matt Damon as two of the film's lead stars, we viewers won't even think of it as a rip-off of the philosophically heavy drama of Interstellar. P.S. Go read the book. It's way funnier. Video: Most. Adorable. Press. Conference. Ever.